This past weekend we visited the coast with some family. While archeological evidence suggests human occupation of Cedar Key as far back as 500 B.C, between hurricanes and isolation, it seems to hover between here and gone. 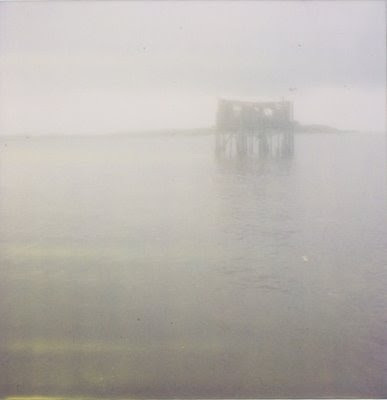 This ghost house sat abandoned to the currents just outside the one we stayed in onshore. We fished facing it, a constant reminder of our tidal presence here. love this post, its ghostly and sociological at the same time. This is such a beautiful photograph. I First thought it was a painting, and that it isn't, that this is a picture of something real, makes it more haunting. The yellow streaks on the grey watery expanse add something strange, and the way the house mirrors - under the water level it looks different than above. I'm crazy about this mysterious photo!